For All of Your Tree Care Needs! Welcome to Rock Hill Tree Service! We take our tree removal service in Rock Hill seriously. We offer professional tree care for all of your tree care needs. We are a locally owned and operated business and have been serving Rock Hill and the surrounding area for years. We take pride in a job well done and we would love to add you to our growing list of customers. 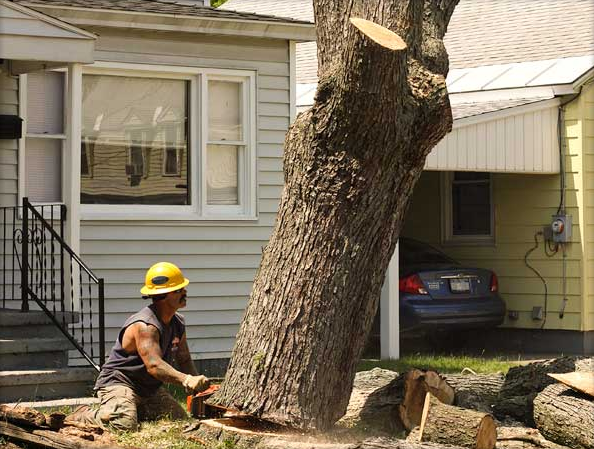 Most people think of a tree removal service as someone who comes in and just cuts a tree or two down or grinds a stump or some limbs and leaves. We want you to know that we take our tree care a step further. We know it may sound corny, but we go out on a limb (pun intended) to give you the best advice about trees that we possibly can. Our certified arborist is like having your own tree consultant. They bring specific experience to your project along with accurate diagnosis and treatment solutions. We love trees and we will share our many years of experience on how to save them before cutting one down. Trees help our planet in so many ways, so we like keeping them around, if possible. If taking trees down is what you need us to do , then you have found the best tree removal service and tree pruning service in the Rock Hill area. We think that we are the best tree service around and not just because our mothers told us so. We have plenty of happy tree care customers that sing our praises from the tree tops (pun intended and a pretty corny joke)! We take care of our customers because we know that a job well done is the best form of advertising out there! Why Choose Rock Hill Tree Service? ​So, weather you're looking for advice about a tree that you have a question about or if you need any of the services listed above, then you've found the best tree removal service around. We offer the best consultation service, most accurate tree health diagnosis and the most friendly attitudes that we can possibly offer. We love to hear the words "job well done." Make sure to give us a call, we would love to earn your business!